This elegant old ruin is in view of a major highway and has one of the most beautiful views of the rolling hills of the area. The story, as I heard it, is that the last man to own the house lost his wife and became a hermit. He lived in the house until it was falling down around him. The sadness that drove this man called ol’ Dave to isolation has been replaced with a calmness and serenity. When I was scoping the house for the series of paintings, I noticed some swallows had made their nests in the walls. The sound of their tweets could not help but make me smile. 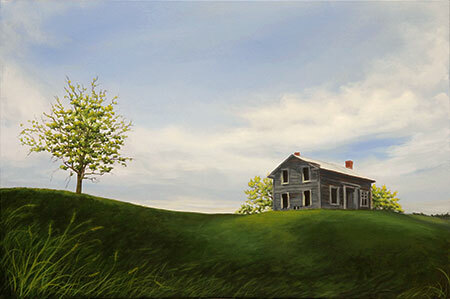 The painting, “Wheat Field Ruin”, is the same house.